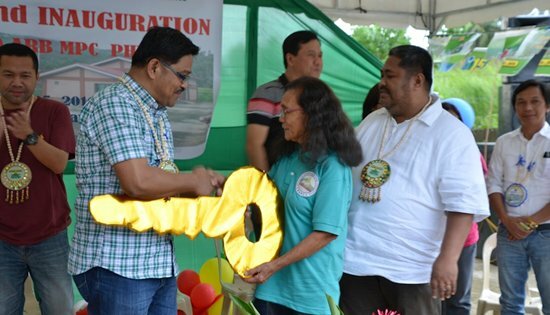 Agrarian Reform Secretary Rafael Mariano turns over the symbolic key for the Balaquid post-harvest facilities to Balaquid Agrarian Reform Cooperative Iladia Calabia as Cabucgayan Mayor Edwin Masbang witnesses the event. CABUCGAYAN, Biliran – Agrarian Reform secretary Rafael Mariano turned over here on Saturday P7.1-million worth of post-harvest facilities (PHF) to the Balaquid Agrarian Reform Beneficiaries Cooperative. But Mariano in his message insinuated that the PHF, which was implemented under the Department of Agrarian Reform’s (DAR’s) third phase of the Agrarian Reform Infrastructure Support Project (ARISP-III), was not enough yet. Though the project consists of a 105-square meter warehouse, a 49-square meter office and a 492-square meter solar dryer, Mariano believed that the cooperative also needs a mechanical dryer to be able to continue their operations even on rainy days. He also agreed with Biliran Representative Rogelio Espina, who was also present during the said occasion, that the cooperative likewise needs a multi-pass rice mill so the latter could go full blast in their rice trading operations. Immediately, Mariano instructed his undersecretary for Foreign Assisted and Special Projects Sylvia Mallari, who was with him, to think ways how the Department could provide these to the farmers. According to him, the country could be rice sufficient if we will help the farmers. In acceptance, Iladia Calabia, chairperson of the said cooperative thanked DAR and said “malaking tulong ang proyekto na ito sa amin na pag-iimbakan at pagbibilaran ng palay dahil karamihan sa mga magsasaka dito ay rice farmers” (this project is of big help to us in storing and drying rice because most of the farmers here are rice farmers). Further, Calabia took the opportunity to request from Mariano and Espina to provide them also a delivery truck so they could save on rentals in the hauling of rice aside from the mechanical dryer and rice mill that had been mentioned earlier by the secretary and the congressman. Meanwhile, Mayor Edwin Masbang disclosed that in 2017 his administration will provide rice subsidy to municipal employees and promised to tap this cooperative as a supplier. Provincial Agrarian Reform Program Officer Renato Badilla explained that the project was funded by the Japan International Cooperation Agency (JICA) and the local government unit. He added that this agrarian reform community (ARC) is a recipient of various rural development projects, which include an irrigation project that could supply water to 60 hectares of rice fields, a 1.7 kilometers farm-to-market road and a potable water system installed in 208 households. Members of the said cooperative were also trained on the Department of Agriculture’s “Palay Check” which increased rice yield in this area, Badilla further added. QUEZON CITY – As the whole nation looks back at the lessons from super typhoon Yolanda (international name Haiyan) that wreaked havoc on the Philippines in 2013, the Department of the Interior and Local Government (DILG) reported that the first batch of post rehabilitation efforts under the Recovery Assistance on Yolanda (RAY) program is already 99.66% complete. The RAY Project provides support and assistance to local government units (LGUs) most affected by super typhoon Yolanda. These LGUs are in the provinces of Palawan, Masbate, Aklan, Antique, Capiz, Iloilo, Negros Occidental, Cebu, Biliran, Eastern Samar, Leyte, and Samar. DILG Secretary Ismael D. Sueno said that the first batch of projects include the repair and rehabilitation of 308 provincial/city/municipal halls, public markets and civic centers, mostly in Eastern Visayas, which incurred the worst damage from the super typhoon. Of these, 305 have been completed and the remaining three are on-going implementation. He explained that the road to recovery has not been easy but Yolanda’s lessons are deeply etched in the hearts and minds of Filipinos. “Three years after Yolanda, we have become more vigilant, more responsible, and more resilient as a people and as a nation,” Sec. Sueno said. For the second batch of RAY projects, the DILG Secretary reported that it is now at 81.50% weighted overall status. That is 2,448 of the 3,591 projects have been completed. There are 754 on-going projects, 294 projects on procurement stage, 43 projects with approved preliminary documents, and 12 projects under preparation of initial documents. RAY Batch 2 focuses on the rehabilitation of totally and partially-damaged barangay facilities such as barangay halls, barangay day care centers, barangay civic centers, and the seven additional municipal facilities which were not funded under the first batch. For the third and latest batch of RAY projects, Sec. Sueno added that it is now at 27.98% weighted overall status. Six out of 615 projects have been completed, 47 are on-going project implementation, 38 on procurement stage, 406 with approved initial documents, and 118 on preparation of preliminary documents. RAY Batch 3 covers the rehabilitation and reconstruction of water supply systems, drainage systems, transport terminals, and halls of justice in Yolanda-hit provinces, as well as municipal and barangay facilities which were not funded under the first and second batches. - 1,189 repairs of municipal halls, public markets, civic centers, barangay halls and day care centers. - Still ongoing are 1,059 projects to rehabilitate and reconstruct these public facilities and spill-over projects for barangay and municipal facilities, including transport terminals, justice halls and water supply systems. - For the first batch of RAY projects released in April 2014, of 144 subprojects worth 938.47 million pesos, 142 have been completed and only 2 are ongoing. - For the 2nd Batch (Barangay projects) released in 2015 with 1,613 subprojects worth 995.06 million pesos, 1,041 or 65.1% have been completed. These are due to be completed by end of 2016. - The 3rd Batch of RAY projects (spill-over projects for both municipalities and barangays not included in previous batches) with 491 subprojects worth 592.64 million pesos released this 2016 are due for completion in 2017. While Sec. Sueno is happy to report the DILG’s accomplishment on post-Yolanda rehabilitation efforts, he is also saddened to note that there are still Yolanda survivors who never got to move on mainly because of the seemingly poor response of those involved in the past rehabilitation efforts. Despite the glaring disparity, many of those who lived to tell about their ordeal are thankful and are more appreciative of life and the assistance from the national government and various national and international offices who have extended their help to the Yolanda survivors. In the same way, citizens should play a more active role in disaster preparedness by taking action and becoming more “listo”(alert). “Let us imbibe the culture of preparedness and make it a way of life so that we can continue our journey to becoming a nation of where every citizen leads a safe, happy and comfortable life,” Sec. Sueno said. Yolanda, categorized as a level 5 super typhoon with 315 km/h wind speed, was one of the most violent and devastating typhoons in the history of the Philippines. MAKATI CITY – Three years after the typhoon Yolanda, the Department of Trade and Industry-Regional Operations Group (DTI-ROG) continuously delivers its promise of uplifting micro, small and medium enterprises (MSMEs) in Yolanda affected areas by engaging a total of 43,573 beneficiaries with a total amount of PHP 655,524,638 in assistance. Based on the summary of accomplishments provided by DTI Region 8, a total of 26,208 MSME beneficiaries came from Leyte followed by Eastern Samar with 8,325 beneficiaries, Samar with 4,239, Biliran with 3,790, followed by Tacloban and Southern Leyte with 556 and 455 beneficiaries, respectively. Among the programs implemented by the DTI-ROG to MSMEs include marketing and technology assistance, SME Roving Academy, Livelihood Seeding Program, financing facilitation through the Small Business Corporation, Diskwento Caravans and financial access. Several beneficiaries of the DTI-ROG initiated post-Yolanda projects are engaged in retailing, wholesaling, food processing, transport and trucking, handicraft and furniture making, among others. “Our assistance to MSMEs specifically in the Yolanda-affected areas is a proof of our unwavering commitment in providing service to the Filipino people,” DTI Undersecretary for ROG Zenaida Maglaya said. She added that the continuity of these projects was also made possible through the concerted efforts of DTI Region 8 Office and the DTI-ROG Head Office. Choie Cabrera, an office employee, started his slippers business in 2003 with one (1) set of sewing machine. After four (4) years of making slippers, he ventured into the t-shirt business some of which includes customized t-shirts and uniforms. A few months before Typhoon Yolanda struck, he was able to register his business with DTI. Five months after the tragic event brought about by Yolanda, Mr. Cabrera restarted his business in April 2014 but has encountered numerous challenges such as electricity problems, damaged production area, insufficient capital, unavailability of sewing machines among others. Through the help of DTI Leyte, Mr. Cabrera was one of the loan borrowers of Small Business Corporation (SB Corp.) with a total approved loan amount of P2 million, which was released in tranches from August to September 2014. Through the loan, he was able to reconstruct his own production area and bought 14 sets of different sewing machines. As of today, Mr. Cabrera earns a monthly net income of P50,000 and he is planning to expand his business specifically in downtown Tacloban. Another beneficiary helped by DTI through its Livelihood Seeding Program in partnership with the Philippine Disaster Recovery Foundation (PDRF) is Igmidio Lagunzad, a dress shop operator. After Yolanda, Mang Igme attended the DTI SMERA Training on Entrepreneurship and Stress Debriefing (Component 1) and he received from PDRF one unit Sewing Machine (Component 2). He was also included in the DTI-OXFAM Partnership where he received cash to buy his required supplies. In commemoration of the typhoon Yolanda tragedy, DTI-ROG continues to help MSMEs through different programs and projects geared towards inclusive growth in the business sector following the mandate of the Duterte Administration and DTI’s Secretary Ramon Lopez of Trabaho at Negosyo. QUEZON CITY – Youth group Samahan ng Progresibong Kabataan (SPARK) rebuked Commission on Higher Education (CHED) Chairperson Patricia Licuanan for statements the group called as “irresponsible and limiting the aspirations of the youth”. The group likewise criticized her mode of endorsing vocational courses. SPARK, an advocate of free and accessible education for all, expressed disbelief over the way the chief urged college aspirants to settle and enlist in Technical Education and Skills Development Authority’s (TESDA) vocational courses instead of pursuing a college degree. Speaking at the Education Summit 2016 conducted last November 3-4, Licuanan observed that notwithstanding the full implementation of K to 12 program, it still remains a priority to Filipino families to send their children to college. However, SPARK sees this as a limiting factor imposed by the state. “Albeit the huge disparity in material well-being, we ought to have equal rights to receive free and quality education. But Licuanan instead of buttressing this, is fundamentally proclaiming that tertiary education is not for everyone, as if she is the ultimate authority in determining who’s fit to receive a diploma or not,” said Clarissa Villegas of SPARK. Villegas emphasized that if there’s one thing that makes us paradoxically globally-competitive, it is the pool of billions of uneducated workforce. According to her, “skilled but illiterate and discounted workers will only propel the youth towards a vulnerable platform of exploitation and misery in this period of global economic integration”. “You can only master a trade so much, but as long as you depend on an employer who consistently retrenches you, in materiality there is no upward mobility. Here, Licuanan’s twisted logic restricts the very purpose of education – vocational or professional, solely for employment gains. TESDA courses might provide short-run employment now, but in the long run you cannot surmount so much of the structural limitations present in our society. You cannot beat chronic poverty with a TESDA certificate. Why make us settle for less? We’re not levelling any playing field by treating vocational education and tertiary education as equals.” Villegas said. SPARK accused Licuanan of shifting the focus away from her failure to provide accessible and quality education despite sitting at the CHED’s top post for more than six years already. “She might as well resign from her post if she prefers the youth to remain uneducated and docile slaves of oligarchs instead of critical and productive members of society,” Villegas concluded. TACLOBAN CITY – Farmers all over Region 8 led by SAGUPA, a region-wide peasant organization held talks with the new DAR secretary Rafael “Ka Paeng” Mariano to present their grievances over the slow and faulty implementation of CARP. Nestor Lebico, Secretary General of SAGUPA-SB revealed that CARP and its extension CARPER proved to be pro-landlord and anti-peasant. He said that the loopholes within the program caters to the landlords and its system of amortization is a burden to the farmers, in fact the sluggish and defective implementation in Region 8 is a testament to its futility. He cited four cases in Leyte to be presented in the dialogue: the slow execution of the case in Palo, the snaillike pace of CLOA distribution in Hacienda MAIC in San Isidro, land conversion by Cali Realty Co. in Tacloban City, and Ching Veloso’s land grabbing cases in Alang-alang, San Miguel and Tacloban City. Lebico disclosed that most of these land reform cases are decades old where farmers have been tilling the land as early as 1960s. In some of the usual cases surrounding CARP, a land covered by CARP was exempted by virtue of land conversion, as is the case in Suhi, Tacloban City. The Department of Agrarian Reform in Region 8 claims to have distributed 430,115 hectares to 193,032 beneficiaries or is equivalent to 86.96 percent of their total target. In this region, the majority of the Agrarian Reform Beneficiaries came from Leyte. “DAR’s report on the implementation of CARP is dubious as these figures are often bloated by different kinds of bogus land distribution. It may include lands with registered certificates of land ownership award (CLOAs) but not yet turned over to tenants who haven’t paid their amortization in full. Double counting also happens wherein the ‘mother’ or collective CLOAs and the ‘individual’ CLOAs are both counted. The most infuriating cases are when CLOA holders are still not occupying the land because of landlord resistance”, Lebico exclaimed. Lebico pointed out that the pro-landlord and anti-peasant nature of CARP will never solve the landlessness of peasants in the Philippines as these landlords will only find loopholes and technicalities to exempt them from CARP. A genuine agrarian reform could only be the answer to this problem the peasants endure since GARB has wider coverage and offers the land freely to the farmers involved. It doesn’t grant exemptions nor does it allow the land to be converted. Also, support will be given to the farmer-beneficiaries. Lebico challenged the new Duterte administration to implement genuine agrarian reform that would truly address landlessness amongst farmers. “I have high hopes with the new Duterte administration especially after appointing a pro-farmer DAR secretary, Rafael Mariano. A genuine agrarian reform that would replace the faulty CARP could be a step in securing land for the landless farmers”, Lebico reiterated. ORMOC CITY – They roasted the biggest pig and offered a thanksgiving mass as 16 more agrarian reform beneficiaries (ARBs) here celebrated their first harvest in 16 years. Farmer Leonardo Nayon says his income will surely increase now that they were already able to work on the land awarded to them under the Comprehensive Agrarian Reform Program (CARP). 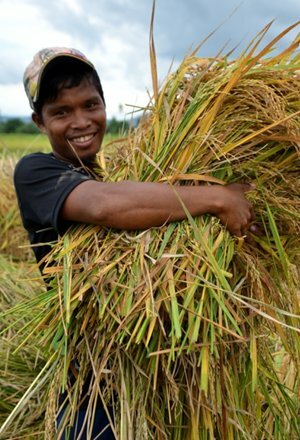 Arnulfo Perez, a member of the Valencia Agrarian Small Farmers Association (VASFA), was overjoyed with the turn of events when they started harvesting rice last month, more than three months after their installation. Perez, 61, said he could now help send their grandchildren to school which he was not able to do to his children. According to him, his earnings will surely increase now that the land awarded to them under the Comprehensive Agrarian Reform Program (CARP) on May 25, 2000 is already in their possession. For 16 years they were deprived entry into the 19 hectares Gerardo Tan property in Barangay Valencia by the previous owner. There were several attempts by the Department of Agrarian Reform (DAR) to install them but all failed to avoid bloodshed in the area. On June 21 this year, with the combined efforts of DAR, KAISAHAN, a non-government organization assisting VASFA, the Philippine National Police and Commission on Human Rights successfully installed the 16 ARBs into their awarded lots. Perez, a recipient of 1.5 hectares, shared how they survived their daily subsistence during the 16 years that they were deprived entry into their awarded lots. According to him, they were lucky if they get hired as farmworkers on a daily basis earning P200 a day. During the ARB’s celebration of their first harvest, Leyte Provincial Agrarian Reform Program Officer (PARPO) Renato Badilla surprised the former with a hand tractor. The farm implement completed the farmers’ happiness, as according to VASFA President Gerry Sabal, they really need it in their farm operation. TACLOBAN CITY – 12 local government units in Eastern Visayas proved that they belonged to a select group of LGUs nationwide that passed the highly coveted “Seal of Good Local Governance” of the Department of the Interior and Local Government (DILG). 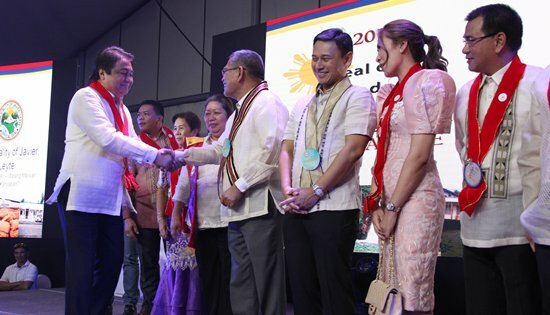 The 12 which include the provinces of Biliran, Eastern Samar, Leyte and Samar; for Cities, Calbayog City; the municipalities of General MacArthur and Salcedo in Eastern Samar; Barugo, Javier, Tabango and Tolosa in Leyte; and St. Bernard in Southern Leyte, received their awards from no less than DILG Secretary Ismail “Mike” Sueno and Senator Juan Edgardo “Sonny” Angara during the culmination program of the 25th Anniversary of the Local Government Code at the Sofitel Hotel, Pasay City on October 27, 2016. According to DILG-8 Regional Director Marivel C. Sacendoncillo, these LGUs passed several levels of validation up to the national levels, the three core SGLG criteria of financial administration, disaster preparedness and social protection, and any one of the essential criteria – business-friendliness and competitiveness, peace and order, and environmental management. Of the SGLG awardees in the region, two – Biliran Province and Barugo, Leyte are repeat winners, having earned the SGLG award the year before. “Let us continue this journey of good local governance, of decentralization and local autonomy and look forward to new challenges under a federal system of government,” said Sueno. Among those given recognition was the LTIA National awardee for 4th-6th class municipalities, Brgy. Hingatungan in Silago, Southern Leyte, which received a project worth P300,000 to be used for further development of their barangay conflict mediation system. Of the 306 SGLG awardees, 43 are provinces, 51 are cities and 212 are municipalities. The SGLG awardees will receive an incentive fund called Performance Challenge Fund, and will be able to access other DILG projects. For the complete list of SGLG awardees, please visit www.dilg.gov.ph (Reports and Resources). The Local Government Code is a landmark piece of legislation that has revolutionized local governance as it devolved powers and authority from the national to the local governments.